Is there a role for functional brain imaging in depression? Many people seeking treatment are interested in the notion that the brain imaging, particularly imaging that looks at neural activity, might be useful in guiding treatment. Up until the last couple of years the answer to this question has always been that the role is primarily restricted to research settings rather than everyday clinical care. Last year I wrote a blog post about an interesting study published in biological psychiatry that suggested that things might be about to change. The study from the iSPOT cooperative group pointed to some value in predicting outcomes from treatment of depression based on functional brain imaging. The study did not have an obvious use in clinical practice, however, since it wasn’t clear what to do with those who fell into the poorer prognosis category. The study looked at 80 patients with major depression and 34 matched controls and performed functional magnetic resonance imaging during the completion of three tasks that assessed separate core cognitive functions: response inhibition, selective attention, and selective working memory updating. After the initial imaging, the patients were randomized to either citalopram, sertraline, or venlafaxine… Functional magnetic resonance imaging scans were repeated after eight weeks of treatment. The study found that greater dorsolateral prefrontal cortex activation during tasks designed to test the ability of the patient to inhibit responses predicted a better response to any of the medications used. Two new articles in the American Journal of Psychiatry suggest some clinical value to fMRI and raise the question of when and how to consider using functional brain imaging in depression. 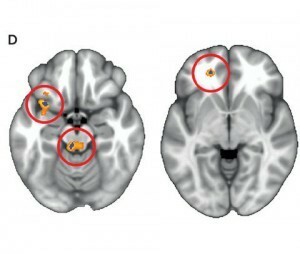 The article by Dunlop, et al, argues that resting state connectivity of an area of the brain know as the subcallosal cingulate cortex may predict whether someone will respond better to cognitive behavioral therapy (CBT) or an antidepressant medication. In another article, Gyurak found that overall response to medication was associated with a normalization of activation of the dorsolateral prefrontal cortex during response inhibition (the active process of not responding to a stimulus), but also that activation of the parietal cortex predicted response to an SSRI versus an SNRI. In this study, we used functional neuroimaging to determine how pretreatment neural activity during cognitive function tasks predicted posttreatment antidepressant outcomes in patients with MDD. Using a Go/NoGo cognitive control task, we found that DLPFC activation was a general predictor of remission, whereas the inferior parietal activation provided additional differential prediction of remission for SSRIs in particular. MDD patients who remitted were distinguished by relatively normal levels of DLPFC activation pretreatment, which attenuated posttreatment (in the same direction as controls). Patients who did not remit showed DLPFC hypoactivation at both pre- and posttreatment. Exploratory analyses of the effects of medication found that remitters specifically to SSRIs showed correspondingly normal levels of inferior parietal activation, which also attenuated posttreatment, while nonremitters to SSRIs showed parietal hypoactivation. Thus, SSRI and SNRI responders showed opposing patterns of activation in the parietal cortex. These studies are tantalizing but there is not yet a consistent story that allows us to say that a certain protocol and type of functional imaging will predict treatment response. For now this kind of testing, using MRI scans performed during specific tasks, is only available in a research setting. But we will be keeping a close eye on developments in the field and update you with new developments related to functional brain imaging in depression. Meanwhile, yet another survey of the literature fails to find any studies that show the value of SPECT scans in predicting treatment response. SPECT scans are the imaging technique used in the Amen Clinic. For now we have to agree with Harriet Hall, that the evidence is not available that supports the value of SPECT scans (which cost around 3000 dollars) in predicting treatment response. Gyurak A, Patenaude B, Korgaonkar MS, Grieve SM, Williams LM, Etkin A. Frontoparietal Activation During Response Inhibition Predicts Remission to Antidepressants in Patients With Major Depression. Biol Psychiatry. 2016 Feb 15;79(4):274-81. doi: 10.1016/j.biopsych.2015.02.037. Epub 2015 Mar 27. PubMed PMID: 25891220.